When it comes to owning a hot tub in Livonia, Michigan or surrounding areas, finding the right size, brand, or color hot tub can be a trying experience. Viscount Pools West makes it easy for you to find the perfect hot tub for your Farmington Hills, Livonia, Plymouth, or Redford, Michigan home. With a variety of brands including Emerald Spa or Great Lakes Spas, Viscount Pools West has the perfect hot tub for you and your family to enjoy. With great pricing on 4-person, 6-person, or 8-person square hot tubs, or 5-person round hot tubs, you won’t need to browse from store to store to find what you are looking for! Whether you are looking for a smaller hot tub for indoors, or a larger hot tub for the great outdoors, size is never an issue with our large inventory of Emerald or Great Lakes Spa brand hot tubs. When looking for hot tub retailers you should visit Viscount Pools West, to find a spa dealer in Michigan, be sure to browse our show room to find accessories to enhance your new hot tub. From thermal hard covers, steps, umbrellas, or cover lifts, you can find it all at our Livonia, MI location. 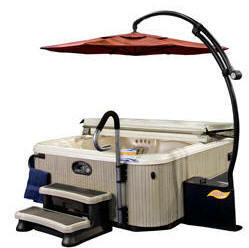 Contact us today for more information on owning a hot tub in Livonia, Michigan.